When I look within America, I can see that since 9/11, the media elites have (of course, with the use of fear) inundated the American people with the fact that we have a foreign enemy of Islamic radicals trying to destroy America by any means necessary. I then noticed that it wasn’t a foreign enemy who they made the target; it was now the American Constitution and the people. I also noticed that it was not a foreign government asking us to give up our rights; it was our own government (and always under the guise of our “safety” and “security”). Are foreign governments violating the Second Amendment while trying to disarm you? Are foreign governments usurping the Fourth Amendment when violating you at the airport while you travel domestically? Are foreign governments attacking your First Amendment right and America’s Christian heritage? Are foreign governments overriding the Tenth Amendment to indoctrinate your children in public schools? Are foreign governments ignoring the Fifth Amendment while facilitating the murder of 3,700 babies a day? Are foreign governments attempting to demoralize you by setting you at war with God so you can become their slaves? Are foreign governments inducing trillions of dollars of debt? In fact, it is not a foreign government; it’s those in America’s government who are foreign to our God and to our Constitution. According to Obama, terrorism is no longer applicable to Islam. Could it be because Muslims call him their own? That being the case, who are the terrorists? There are some in government today who want you to look past themselves in hopes that they can now make terrorists out of whomever disagrees with them and their administration. It’s not a foreign government that is trying to tear down the Constitution and recreate it in their own image; it’s Obama and his administration. Don’t forget to Like SonsOfLibertyMedia.com on Facebook, Google Plus, Tea Party Community & Twitter. The Internal Revenue Service has been seizing money from the bank accounts of individuals and businesses with no proof of any crimes nor any charges filed. Now, the IRS claims that it will stop — but will it? Using a law, the Civil Asset Forfeiture Reform Act of 2000, that allows the feds to seize money from suspected gangsters, drug dealers and terrorists, the IRS has put innocent people into bankruptcy and massive debt and taken the money a military father saved from his paychecks to put his kids through college, solely by tracking the amounts that people put into their bank accounts. When no criminal activity is charged, The New York Times reports, the IRS often negotiates to return only part of the seized money, leaving impoverished citizens with little option but to either accept the IRS’ offer or continue a lengthy and very expensive legal battle to try to get their legitimately earned money back. The problem has been growing. The Institute for Justice estimates that from just 114 seizures in 2005, the IRS made 639 seizures in 2012, and in only 20 percent of the cases were any criminal charges ever pursued. Under the Bank Secrecy Act, banks report transactions larger than $10,000 to federal authorities, but also report a pattern of regular, smaller deposits which appear designed to get around the act. This alone can be enough to trigger a seizure, the Times reports, and banks filed over 700,000 “suspicious” reports last year. One involved a 27-year-old Long Island candy and cigarette distribution company, Bi-County Distributors, which made daily cash deposits, usually under $10,000. When the IRS seized $447,000 from the company, it refused to return it, despite the fact that there was no crime to prosecute, and instead offered a partial settlement. Army Sgt. Jeff Cortazzo was saving up for his daughters’ college education when the IRS seized $66,000 of his money – it cost him $21,000 to get the remainder back. I have been warning everyone that the gold and silver derivative markets were being “set blaze” for the last few months and that the backrooms of these major participants (Deutsche Bank, JP Morgan, Citibank, HSBC, et al) are being gutted. These banks are not long for this world. News coming out this weekend that a MAJOR, MAJOR player in this “Mafia-Like” banking cabal has been found dead in the midst of the chaos. (Reuters) – A senior Deutsche Bank regulatory lawyer has been found dead in New York after committing suicide, New York City officials said on Saturday. Calogero Gambino, 41, was found on the morning of Oct. 20 at his home in the New York borough of Brooklyn and pronounced dead on the scene, according to New York City police. Gambino was an associate general counsel and a managing director who worked for the German bank for 11 years, according to the Wall Street Journal, which first reported his death. Gambino was also an associate at a private law firm and a regulatory enforcement lawyer between 1997 and 1999, the Journal said, citing Gambino’s LinkedIn profile and conference biographies. Yes – this likely part of the Gambino crime family is knee deep in gold and silver derivatives…surprise! The Gambino family found out long ago that a life of crime in the Stock Market is much cleaner and much easier than the ways of their ancestors! – Breaking stories of the largest derivative holder in the world, Deutsche Bank, having derivative problems in their quarterly report to be released on the 29th. – News over the weekend of at least two newly suicided banksters that dealt in complicated derivative transactions…potentially more on the way. – Ebola outbreaks in New York City as fear spreads throughout the subway every time someone sneezes. – The long term manipulation of the stock market bubbling up to it’s all time highs. The Shocking Truth the History Channel Can’t Tell You! Wow, it looks like the day has finally come that we get to make the big announcement that one of the exotic free energy generators has made it to market. Patrick Flanagan, who just purchased a 5kW system, brought this one to our attention. GDS Technologies LTD, out of Ontario, Canada, has a water-powered, portable genset available for sale on their website, in output sizes of 5 kW, 10 kW and 15 kW, at a price of around $1000/kW. They say they can also custom build these in sizes up to 50 kW. It is controlled by a simple on/off switch. It is much less than half as loud as a gasoline or diesel genset of the same power output. One tank of water (e.g. 4 gallons for the 5 kW) will run the device for three days; or you can hook a hose up to it (there is a check valve), and not worry about refilling the tank. It emits no pollution, no fumes, so it can be run indoors. They will ship globally. The 15-day money-back guarantee doesn’t include duties and shipping fees. “Please allow up to 14 business days,” for shipping probably refers to Canadian orders. International probably takes more. Their Alibaba listing for their GDS 3000 system says they have 400 in stock. Actually, I’m surprised we’ve not heard of them before now. Their YouTube video has been up since September 7, with over 2000 visits, and their Facebook page was first populated with news about this on August 24. It seems they’ve been very conscientious in their design, putting in safety features (circuit breakers and emergency stop button), redundancy (e.g. 2 batteries instead of one, to start it up). Maintenance involves draining the water tank and spraying it with a garden hose every 3 months. The water needs to be clean that it runs on, and not salt water. If you are thinking of powering your house with one of these, you need to realize that it is not yet UL / CE certified, so you could be voiding your home warranty. For emergency back-up, you’ll want to make sure that you have a toggle switch to shut off from the grid completely when running the power from the genset into your service panel. If you’re doing only small loads, you could plug your genset into a wall plug, through a male-male connector, which will power up one of the two legs of the service panel; then run an extension cord to another wall power plug from the other leg of the service panel, and the entire panel will be powered. Again, make sure you’re disconnected from the grid if you do this so you don’t jeopardize any linemen. Bear in mind that the wires going to that wall plug are 12 or 14 gauge, and limited to maybe 15 amps, so you’ll not want to surpass that in the load you draw elsewhere in the house, or you’ll trip the circuit breaker. You could double this limit by plugging into two separate circuits through the wall plugs, such as from two different rooms — ditto for the other leg of the service panel. After we get some kind of validation that this is for real, we’ll be bumping it to #1 in our Top 5 listing. LOS ANGELES — Early in Laura Poitras’s documentary “Citizenfour,” Edward J. Snowden, who exposed vast electronic surveillance by the United States government, tells what pushed him to go public. But do some of President Obama’s staunch Hollywood supporters share his sentiment? Her provocative, and deeply admiring, look at Mr. Snowden — which had its premiere at the New York Film Festival on Oct. 10 — arrived here this week amid high hopes, intense curiosity and more than a few raised eyebrows over its sharp critique of Mr. Obama, a president who has enjoyed strong support in the movie world. The intrigue is especially pitched because several of the companies behind “Citizenfour” — which takes issue with Mr. Obama’s expansion of Bush-era surveillance, and his administration’s attempt to prosecute Mr. Snowden for espionage — are led by some of the president’s close political allies. They include Harvey Weinstein, the Weinstein Company’s co-chairman, as well as Jeff Skoll, the founder of Participant Media, and Richard Plepler, the chief executive of HBO, who all have been major contributors to Mr. Obama’s political campaigns. 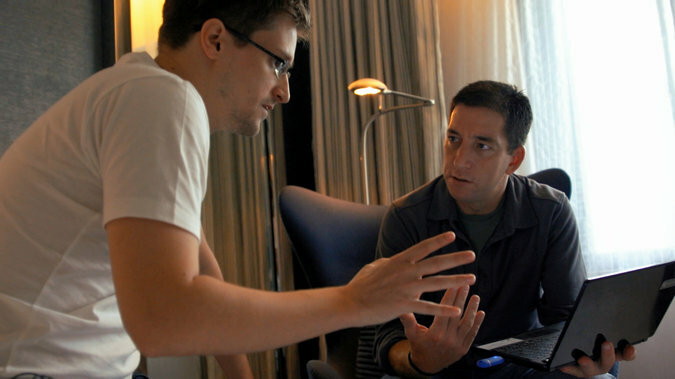 “Citizenfour” has already landed high on the handicappers’ lists of prospects for a documentary features Oscar. The film also promises to jolt the award season with a dose of real-world politics, as happened in 2012, when Steven Spielberg’s “Lincoln,” Kathryn Bigelow’s “Zero Dark Thirty” and Ben Affleck’s “Argo,” the year’s best picture, converged on Washington, with screenings, receptions and a Congressional uproar over the portrayal of torture by Americans in Ms. Bigelow’s film, which was about the hunting down of Osama bin Laden. The role that Mr. Weinstein, whose Radius-TWC unit is backing the film (and distributed last year’s Oscar-winning documentary “Twenty Feet From Stardom”), will play in promoting “Citizenfour” remains unclear. In the past, he has not shied from using his association with Mr. Obama to promote issues-oriented movies. These include the biopic “Mandela: Long Walk to Freedom,” which had a much-publicized White House screening last year, and the documentary “Bully,” which was screened for Mr. Obama in 2012, just minutes after he announced his support for a pair of anti-bullying bills. Also in 2012, Mr. Weinstein arranged a high-profile Washington showing of his “SEAL Team Six: The Raid on Osama bin Laden,” raising complaints that its flattering portrayal of Mr. Obama — who was edited into the film before its election-week premiere — amounted to a campaign stunt. On Tuesday, it was the Radius-TWC co-presidents, Jason Janego and Tom Quinn, and not Mr. Weinstein, who played host as Ms. Poitras introduced “Citizenfour” to film buffs and some potential Oscar voters at the Los Angeles County Museum of Art. In a later phone interview, Mr. Quinn and Mr. Janego said they had exercised considerable autonomy in acquiring rights to “Citizenfour” after Mr. Quinn visited Ms. Poitras to discuss the unfinished film at her home in Berlin. Both stressed that Mr. Weinstein and his brother, Bob, co-chairmen of the parent company, were not a driving force in the decision to distribute the film, which is to open on Friday in Los Angeles, New York, San Francisco and Washington. “We did not see the actual film until very late in the process,” Mr. Quinn added. Promotional screenings and talks are likely among the tech crowd in San Francisco and among political types in Washington, but scheduling has been hampered by that late delivery, he said. The potential power in “Citizenfour” lies less in its revelations — though its ending points to the existence of another, as yet unidentified, government-surveillance whistle-blower — than in its intimacy and attempt to make narrative sense of the disclosures by Mr. Snowden, a former N.S.A. contractor. At the film’s core are startlingly close encounters with Mr. Snowden, shot during eight days in a Hong Kong hotel room in 2013, as he began revealing secrets of the N.S.A. to the journalists Glenn Greenwald and Ewen MacAskill, and wrestled with the implications of his leaks. At one point, in nearly silent pantomime, he reshapes his beard and restyles his hair, preparing to slip from the hotel and eventually seek refuge in Russia. The footage of Mr. Snowden is framed against shots of Mr. Obama and members of his administration, first denying the existence of domestic surveillance, then promising a review of programs, and finally insisting on Mr. Snowden’s prosecution. In the Oscar race for best documentary, “Citizenfour” is likely to find itself up against some less volatile documentaries. Among those are “Red Army,” about Soviet hockey stars; “Life Itself,” about the film critic Roger Ebert; and “Tales of the Grim Sleeper,” about the predations of a serial killer in South Los Angeles. But “Citizenfour” recalls a different political dynamic, in 2004, when Mr. Weinstein introduced Michael Moore’s anti-Bush “Fahrenheit 9/11” at the Beverly Hills headquarters of the Academy of Motion Picture Arts and Sciences with a personal tribute to Mr. Moore. The two received a roaring ovation from like-minded Academy members. But “Fahrenheit 9/11” won no Oscars. It was ruled out of the race when Mr. Moore chose to air it on pay-per-view television shortly before the presidential election. This time around, though, some key voices are quieter. Mr. Janego, on Wednesday, asserted that Ms. Poitras’s cinéma vérité approach leaves a comfort zone for both those who support Mr. Snowden and those who find his actions offensive. “You’re left to make up your own mind,” he said. Neil Keenan: HAIL HAIL TO THE REPUBLIC OF THE UNITED STATES OR NOT????????? Last Friday it was revealed that the purpose behind Secretary of State John Kerry’s visit to Saudi Arabia a few weeks back was to sign a secret deal by which the leading OPEC state would saturate the markets with excess oil and cause prices to fall for the global commodity. This move would have the consequence of causing vast harm to the Russian Rouble, and increase inflation and price instability for the Eurasian state. However, on Oct. 13 Russia‘s strongest ally and member nation in the BRICS coalition signed its own deal with the Eurasian power to not only help stabilize prices for the beleaguered economy, but increase direct non-dollar trade with a 150 billion currency swap deal through which Russian Roubles are traded directly for Chinese Yuan. This new deal will have the effect of bypassing the dollar and the the reserve currencies overt effects on the Rouble that is part of the ongoing proxy war between America and the East, and also mitigate some of the consequences of the secret Saudi oil program. China is ready to export agricultural products and oil and gas equipment to Russia, China’s Vice Premier Wang Yang stated Saturday. “China is willing to export to Russia such competitive products as agricultural goods, oil and gas equipment, and is ready to import Russian engineering products,” Wang Yang said during the 18th session of the Russian-Chinese Commission for the Preparation of Regular Meetings of the Heads of Governments. The significance of this deal is two-fold. First, by allowing for Russia to have direct trade between themselves and China in their own national currencies, Russia can mitigate some of their escalating price inflation within their country that is a direct result of Saudi Arabia’s overt actions to drive down the price of oil. Secondly, by facilitating the purchasing of Chinese products without the use of the dollar as a middle-man, Russia puts even more pressure on Europe who is hemorrhaging trade that had been a mainstay between the EU and Russia, and which is now accelerating Europe’s path into recession. As long as oil is denominated in dollars in the global market, the U.S. can and will use its control over the petro-dollar and reserve currency to inflict economic war against any and all nations that do not cede to American national policies. And with the U.S.’s current desire to escalate chaos in both Ukraine and Syria, and to keep Russia out of the picture and unable to protect their new and long-standing allies by disrupting their economy and currency, today’s intervention by China may be the key in allowing Russia to stabilize prices within their economy, and to inflict greater harm to America’s allies who still are beholden to dollar denominated trade.